Port Moody, one of the last places I've yet to blog about. There hasn't been a particular reason that has prevented me from doing so. Hey, I used to live in Coquitlam and I would often dine here. Now, with a quaint little place such as Port Moody, you'd expect to find places like Pajo's at Rocky Point or Saint Street Grill right on the main strip. 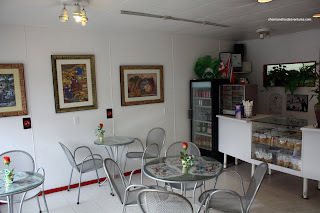 It would not be an obvious choice if you were looking for an authentic Caribbean roti. Yah, that's what I thought when I first spotted Rehanah's Roti nestled among other restaurants. It's a small place; but you can't miss it with it's red awning and unique name. Even though it was late in the afternoon, there were people waiting for their orders. Appearing to be a one-woman operation, there was a slight wait. At first, I was asked if I was from Trinadad. Interesting question; however, I do have Asian friends who have come from there. She was curious how I knew about the place. Well, partly because I pass by it often and that Frank from Calypso had mentioned it too. 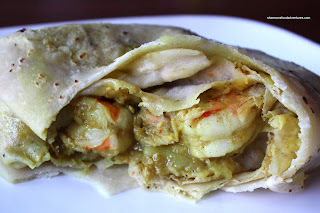 I originally wanted to try the Goat Roti; but I chose a more conservative choice in the Chicken Roti. I could've had it spicy or medium. I went for medium since the last time I chose spicy (House of Dosas), it was as hot going in as it was going out (TMI!). When I went to grab the takeout bag, I was surprised how heavy it was. This thing has got some substance to it! If you are familiar with the Malaysian or Thai roti, it's rather flaky. The one here is much thinner and chewier. For this application, it is absolutely the perfect texture and consistency. It helps hold the massive amount of chicken and potatoes in while you eat it. And about that filling, for being a "medium", it was pretty darn spicy. Not crazy spicy; yet there was a real kick f rom the curry. I can only imagine how hot the spicy is! The chicken was tender while the potatoes were creamy soft. I was only planning to eat half; but I ended up eating the whole darn thing. I shouldn't have done that since I was just about to go play hockey. So I make a return visit in hopes of trying out the Goat Roti to no avail. They're sold out! Undeterred, I went for the Shrimp Roti not expecting much. I bit into it expecting shrimp and what I got were tonnes of perfectly cooked crunchy prawns! Combined with the same delicious curry and soft potatoes, this was a nice treat. Again, I was only planning to eat half and finished the whole darn thing! I highly recommend that you do! I had their roti's years ago and should go back. They were delicious...good to hear that nothing has changed! i checked out their menu on urbanspoon and i'm curious. phillowrie balls? don't know what those are but i want some! i'm working in poco a lot so i'll have to try that and some shrimp roti. You passed on the goat Sherman! Looks like a hardy meal; I've never had the joy of roti like this. I'm going for goat next time! Yes, the phillowrie balls looked interesting on the menu, but i didn't try them. I went for the shrimp and goat roti plus a side of mango sauce instead. The shrimp was nice and crunchy and the goat, well it was gamey. Since I've realized I haven't developed an appreciation for gamey meat, I think I'll stick to the shrimp or chicken next time. The medium hot was not spicy enough for me but I wanted to be cautious. The potatoes were so nice and soft that they melted in your mouth. The mango sauce provided a nice balance to the curry. The roti was as good as any home made ones I've been lucky enough to eat, a soft and chewy texture which is slightly denser than a crepe. Maybe I'll try some of those phillowrie balls next time. Holly, I personally love their roti, the texture is perfect. Yah, I haven't tried the goat. I stuck with the shrimp and they are sure good. we go to Rehanah's every chance we get. Being from Trinidad originally, I can attest that this roti is as good as the best roti you can find in Trinidad - and I haven't found anything else even close in BC. 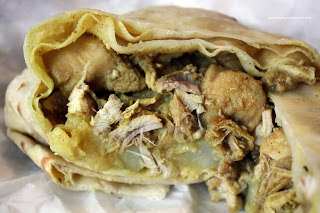 The curry goat roti is a favourite in Trinidad. At Rehanah's it's mixed w/ potato - AND it's all my Northern-BC-born hubby will get except for when he gets the goat w/ shrimp for a change - bcz he loves it so much. 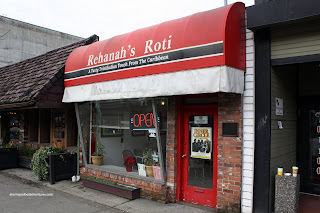 Whether we lived in Abby or Van West, we have always looked for excuses to go to Rehanah's. I haven't tried pholouri balls from Rehanah's but I loved them in Trinidad. They are more of an appy - fun, not necessarily satisfying as a meal. @foodie Sorry that you had such a bad experience... But... remember, we're in the GVRD. We can only compare to what we have here. Of course there is better elsewhere. But we're not in elsewhere.